Electric buses: Proterra wants to rid America of emission-spewing buses. Proterra electric buses aren’t cheap, but they cost less to operate than traditional city buses. Forget about Tesla and its futuristic new Gigafactory. When it comes to using electricity for transportation, the real action may lie in the polar opposite of the fancy sports car. Municipal intracity buses may be déclassé, unloved, slow, lumbering behemoths. But they’re the workhorses of America’s transit systems. Last year, according to the American Public Transportation Association, buses hauled 5.36 billion passengers. While usage has fallen in recent years, thanks in part to the growth of light rail and subway systems, buses still account for more rides each year than heavy rail, light rail, and commuter rail combined—and for about half of all public transit trips. Proterra, a South Carolina-based manufacturer with Silicon Valley ties, thinks it can lead the electric revolution. Fueled by the two forces that are transforming renewable and alternative energy in this country—venture capital and the U.S. government—the company has already put a few dozen electric buses on the road, with the promise of more to come. “Our technology could literally remove every single dirty diesel bus from cities,” said Proterra CEO Ryan Popple. It’s difficult for all-electric vehicles to compete against super-efficient hybrid gas cars like the Prius or the hybrid-model Camry, which already get very good gas mileage. “But we’re competing against the most atrociously inefficient vehicle in the planet,” said Popple, a former finance executive at Tesla. Buses present operators with the painful combination of horrid gas mileage and heavy usage. Nationwide, city buses averaged about 4.71 miles per gallon, according to the National Transit Database. Washington, D.C.’s WMATA reported in 2012 that its buses were getting 3.76 miles per gallon. And they are driven a lot. A city bus can be driven between 40,000 and 60,000 miles per year, all while spewing unwanted emissions into the air. Swap out oil for electricity, and you reduce fuel costs sharply. Get your electricity from renewable sources, and you’ve cut the link between fossil fuels and vehicle transportation. Founded about a decade ago, Proterra originally set out to make buses powered by a different eco-friendly source: fuel cells. But as the hybrid and electric car businesses grew, and the prices of battery packs and electric motors fell, making a purely electric bus became more appealing. Proterra devised a 40-foot bus made of light materials, and then developed a fast-charging docking station that would let buses fuel midroute in 10 minutes or less. Unlike Tesla, Proterra didn’t receive any Department of Energy loans. It has raised more than $100 million in venture capital money. But the company does depend indirectly on public funding provided by the Obama administration. Its customers, which are all public agencies, have relied on stimulus funds and TIGER (Transportation Investment Generating Economic Recovery) grants to purchase the vehicles. Proterra shipped its first completed vehicle to Foothill Transit, which serves 22 cities in eastern Los Angeles County, in 2010. The agency, which has 350 buses, virtually all of them powered by natural gas (a lower-emission alternative to diesel), used stimulus funds to buy three electric buses and a docking station. In 2011, Silicon Valley venture capital aristocrats Kleiner Perkins invested in Proterra, and the company began to make further sales to small transit agencies: in Tallahassee, Florida; Reno, Nevada; and Worcester, Massachusetts. Customers I spoke to say the buses largely work as advertised. After its initial purchase, Foothill used Transportation Department funds to buy another 12 Proterra buses. Foothill has put them into service on the 17-mile Line 291 in Pomona, one of the agency’s most trafficked routes. They stop in the middle of the route for about five to 10 minutes to recharge. “The cost of energy per mile is about half what it would be for diesel,” said Doran Barnes, executive director of Foothill Transit. StarMetro in Tallahassee, which has a fleet of 72 diesel buses, found itself coping with budget problems when the price of diesel spiked in 2007. Fuel is typically the second-highest cost for a transit system, behind labor. StarMetro was Proterra’s third customer, ordering three buses in 2010 and two more in 2011, backed by federal funds. “We put them on our most visible route,” said Ralph Wilder, superintendent of transit maintenance. The buses can easily handle the 18-mile loop, which runs from Tallahassee Community College to the Governor’s Square Mall. On this route, all buses stop for 10 minutes in the middle, to wait for connections, so charging up the electric ones doesn’t add any time to the trips. Recharging takes about 7.5 minutes. As is the case with electric cars, electric buses are significantly more expensive than their gas-guzzling counterparts. According to the American Public Transportation Association, in 2012, the basic city bus cost $447,000 while hybrid diesel-electric buses cost $593,000. 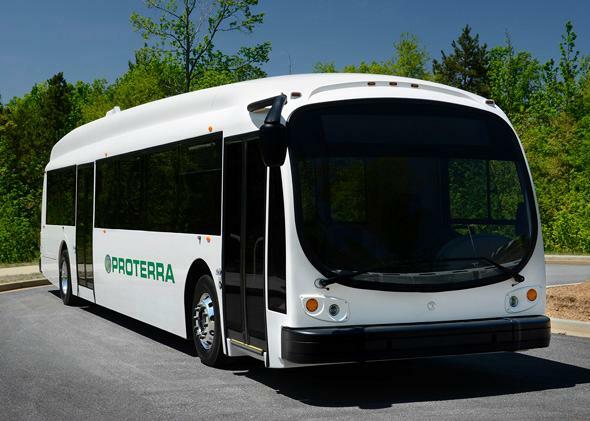 * The base price of a Proterra has fallen to $825,000, from about $1 million a few years ago. And purchasers don’t get a tax credit or rebate for buying one. “But we don’t need grant funding to make the business case work,” said Popple. Over the 12-year lifetime of a vehicle, a diesel bus can consume between $500,000 and $600,000 of fuel, while it would consume about $80,000 worth of electricity, based on average industrial electricity rates. At its current price, in other words, the lower-emission Proterra pays for itself over time in the form of lower operating costs. There are complications, however. The range—up to 30 miles—limits Proterra buses to certain routes, so it’s hard for an agency to go all in. Drivers have to be trained to brake and accelerate differently, and to maneuver into the docking stations. And Doran Barnes of Foothill Transit notes that some of the cost advantage of using electricity instead of diesel can dissipate. Electric cars can be charged at night, when power prices are low. But buses have no choice but to recharge in the middle of the day, when utilities often impose higher peak usage rates. Not surprisingly for a Silicon Valley veteran, Popple has big, quasi-utopian plans. “The urban transit bus market will go entirely electric,” he proclaimed. But for now, Proterra remains a craft operation in a mass business. There are about 37 of its buses on the road. The company, which employs about 180 people, runs a single shift at its factory in Greenville, South Carolina. It is on a pace to produce about two dozen buses this year. “We’d have to make 50 per year to be profitable,” said Popple. In other words, all it would take is one large system to embrace the buses on a significant scale. And there may be one out there. King Country Metro Transit, Seattle’s progressive transport operator, has about 1,500 buses and is based in a region that enjoys cheap hydroelectric power. Last month it announced it would use a federal grant to purchase and test two Proterra buses. The deal, Popple noted, has an option for the agency to buy up to 200 more. An order of a couple of hundred buses doesn’t sound very exciting, especially compared with Elon Musk’s promise of $5 billion factories. But electrifying America’s fleet of transit buses would put a far larger dent in carbon emissions than putting a few hundred thousand Teslas on the road.